Mozgus is one of the chief Inquisitors of the Holy See, traveling the world with his group of torturers, sent to root out a violent cult of heretics in the city of St. Albion. He is the main antagonist in the Tower of Conviction, hindering with his excessive religious zeal, Guts tries to save Casca. His symbol is four torture wheels, embodying his willingness to use torture as a way to cleanse people from evil. Mozgus, prior to the events told in the Resurrection Arc was a zealous Inquisitor, acting on behalf of the Holy See. There he recruited a small group of marginalized, disfigured individuals, comforting them by reading parts of the Holy See Doctrine, meant to reassure them that even their disfigurements were meant to be worn with pride as a gift from God, and training them in his particular brand of torture, vicious and rarely leading its survivors to walk away without serious wounds. He is then sent to St. Albion to root out heretics on the behalf of the Holy See, requesting the Holy Iron Chain Knights as his personal guard. Albeit a true heretical group is brewing in the mountains surrounding St. Albion, based on orgiastic rituals, Mozgus himself apparently does little to stop them, managing to capture many of them only by Farnese's intervention. Instead, he sets every bit of his attention towards smothering in blood and tortures the rebellions of the poor and starving population of St. Albion against the tyrannical rule of the Holy See. Mozgus sees such acts of defiance against himself as defiance against God, whose rule he is meant to embody. Upon capturing Casca, mistaken as a witch by the local heretics and priests alike, he realizes how the recent accounts of the Black Swordsman may be related to the mute, amnesiac branded girl, so, as usual, tries to torture her as a way to get some more information. Instead, he merely triggers the appearance of a huge band of demons, attracted by the Tower itself, chosen place for the Incarnation Ceremony, and the presence of the Brand. Mozgus doesn't flinch at all, instead closing himself in the chapel of the Tower of Rebirth, where the Apostle-Behelit uses his venom to turn Mozgus and his servants into Apostle-spawns with angelic features, as a way to hasten the Incarnation Ceremony. 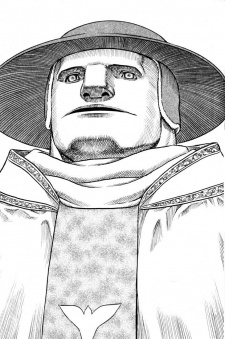 Without ever knowing what befell him, Mozgus believes that his angelic wings, his increased stamina, and the growing of a scaly hide able to withstand blows from the Dragonslayer, and Guts' arm cannon were gifts from God, and decides, as a way to stop the Ceremony and quell the population's fears, to burn Casca at the stake, forcing Guts to come out. After a heated battle against his mutated servants, Guts himself is almost defeated by Mozgus, until he manages to drive his sword into the only weak spot in Mozgus' hide: a small, weaker plate with the Holy See insignia, a representation of the Holy Book he always brings with him. Shortly after his death, the Incarnation Ceremony is completed, with Griffith's rebirth and the total destruction of St. Albion.